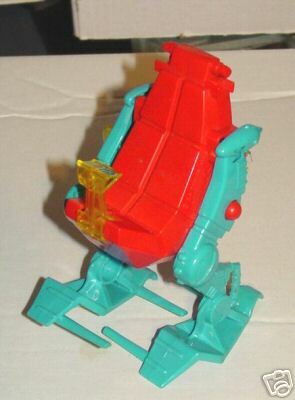 Back in 2013, I featured this Super Powers toy. 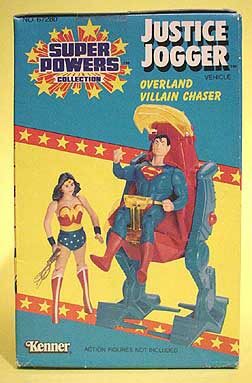 I guess the best way to describe it is to call it a walking easy chair for Superman. I’ve seen the promos for the upcoming Justice League movie and I am disappointed that this didn’t make the cut. I’m hoping they are saving this for the surprise reveal in the film’s climax. LOOK! Up in the sky! It’s a bird! It’s a plane! It’s… it’s… probably just a bird or a plane. So where’s Superman? Lex Luthor has just stolen the Fregosi Emerald and he’s making his getaway down Bates Avenue! Someone has to stop him! 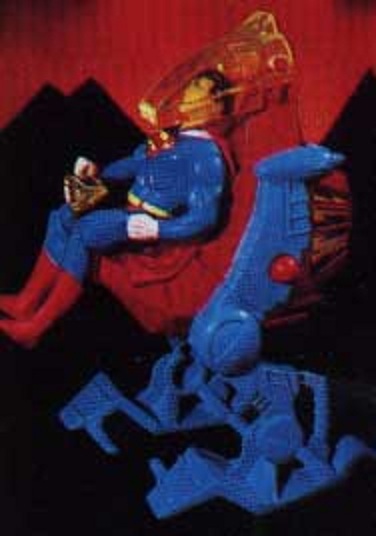 Oh, wait a minute, here comes Superman, reclining in an easy chair and drinking a nice warm cup of tea. He’s wearing a cardigan and slippers. Huh? How does he ever expect to catch Luthor now? Oh, catch him he shall. For superman is taking it easy today, sitting back and catching up on some reading while pursuing evil in his JUSTICE JOGGER! Superman appears to be asking for some lemon for his tea. Wonder Woman is disgusted. Yes, for those days when leaping tall buildings in a single bound just sounds like too much effort, and flying at supersonic speed is a lot of work, Superman whips out his JUSTICE JOGGER and chases the bad guys at a nice and sedate, moderate rate of speed. And hey- power stepping action! No longer will medium-sized rocks stand between Superman and rounding up the Royal Flush Gang. It even has a sun roof! This looks like so much fun! Doesn’t it? DOESN’T IT??? Wow- that sun roof is windup powered! 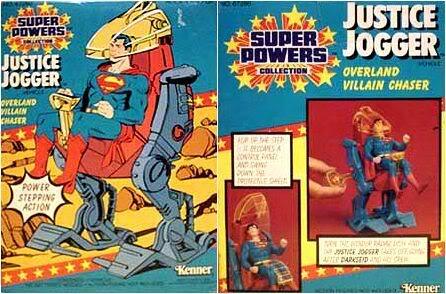 And can you believe that the package says that Superman could catch Darkseid in that? 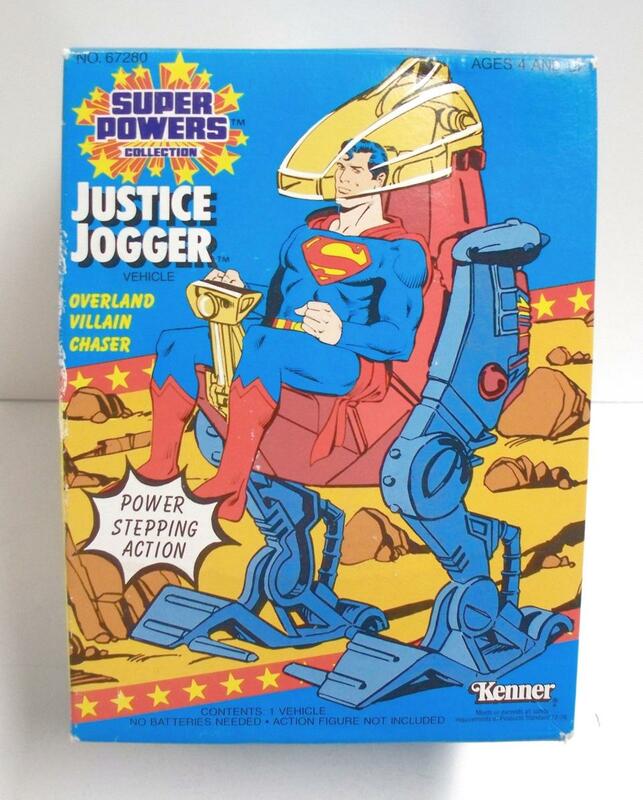 Whoa, is there anything the Justice Jogger can’t do? Probably catch Darkseid, for one thing. This one broke down when Cyborg took it to Detroit and it was stripped for parts by a gang. LOOK! Up in the sky! It’s a bird! It’s a plane! It’s… it’s… probably just a bird or a plane. So where’s Superman? Lex Luthor has just stolen the Fregosi Emerald (get it?) and he’s making his getaway down Bates Avenue! Someone has to stop him! Oh, catch him he shall. For superman is taking it easy today, sitting back and catching up on some reading while persuing evil in his JUSTICE JOGGER!